Volkswagen revealed an electric car sketch that its original form will be introduced at the Paris Motor Show 2016 to be held on October 2 to 16, 2016. These five-door hatchback of VW will compete with the BMW i3 and Model 3 of Tesla Motors. 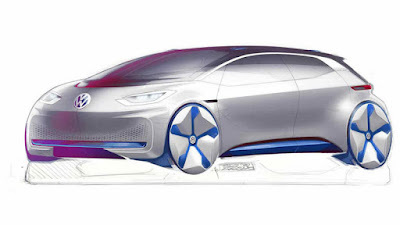 From the picture, it seems clear that the design of VW electric car was carrying the futuristic theme. It can be seen from the shape of the lights and rear roofline that extends up to the brake lights. The absence of a conventional engine behind the front bonnet, made the car's nose became shorter and no grille used as well. The futuristic sporty impression is also visible from the use of large and modern rims. While the rear passenger door applied sliding door system. Volkswagen CEO Matthias Muller revealed that the car is scheduled to be sold starting in 2019, and claimed to have a cruising range of 400 to 480 kilometers when its battery fully charged. The time to recharge full its batteries only takes 15 minutes. While the engineer who makes these VW electric car, Christian Senger, explained that the cruising range of 480 km can be achieved for daily use. He adds nothing special material making up the body of this vehicle. The material is also used in vehicles marketed today. "There is no use of radical body concept," he said, as quoted from Autoblog. Its size was equal to the Golf hatchback models currently marketed. However, since it using electric motors, make the cabin atmosphere becomes more spacious, even approaching to the Passat models.